an increase in the number of timeshare units from 730 units in Massanutten Village to roughly 1,230 units in an incorporated town of Massanutten. As previously discussed, the only services that a town must provide, pursuant to the VA Code of Law, are the services of comprehensive planning and zoning. These services include creation and amendment of a Town Comprehensive Plan and Town Zoning Ordinances as well as zoning administration and enforcement. All other allowable town services such as law enforcement and public works (to include road maintenance) are optional pursuant to the VA Code. This somewhat complicates any analysis of expenditures for an incorporated town of Massanutten. Therefore, it was decided that several alternatives of town provided services would be examined to develop expenditure profiles for an incorporated town of Massanutten. These alternatives provide a framework of what a town of Massanutten might look like from an expenditure standpoint and allow associated revenues to be analyzed in the next subsection. Please note that the expenditures for each alternative were found to be largely driven by required staffing for services discussed in detail in Section VII of this report. Prior to discussing these alternatives, it is important to emphasize that the mix of services to be provided by an incorporated town of Massanutten is highly dependent on what services would be needed for the Massanutten Village area. Currently, MPOA privately provides services in this area, such as road maintenance and law enforcement. Sections IV and V of this report discussed some advantages to allowing an incorporated town of Massanutten to provide these services more cost effectively by having the ability to balance the financial burden on property owners, citizens, businesses, and visitors plus having access to state and federal funding. The key to what services the town will provide is to determine what assets will be turned over or transferred by MPOA. The following is a description of five (5) alternatives that were examined for a possible incorporated town of Massanutten — each alternative is related to possible services the town could provide and their related costs. Each alternative is designated with the letter «T» for «Town» followed by a distinct number. 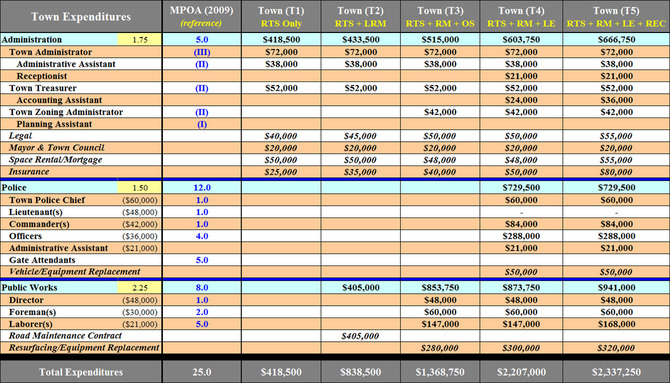 The designations along with abbrs were created for the summary table of town expenses shown below for each alternative. It should be noted that these alternatives are identical to those related to town staffing discussed in Section VII. It should also be noted that, in each alternative, the service of trash collection and recycling is provided by an incorporated town of Massanutten for all town residential property owners. The expenditures for MPOA in 2009 are included as a point of comparison. This alternative is an incorporated town of Massanutten that just provides its citizens with the services of comprehensive planning and zoning, as required by the VA Code of Law. The total town expenditures for a town alternative including just required town services (RTS) were determined to be $560,250 per year. This alternative is an incorporated town of Massanutten that provides its citizens with the services of comprehensive planning and zoning, as required by the VA Code of Law. 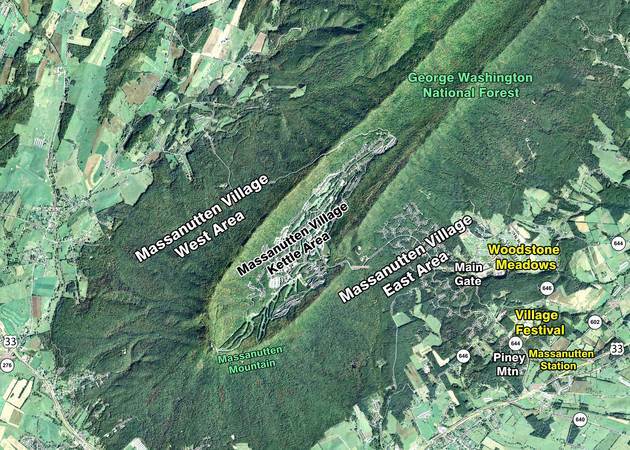 Additionally, the town would provide its citizens with limited maintenance services for roads already in the VDOT Secondary Road System (see Section IV for details) along with Massanutten Drive and Del Webb Drive — the latter two (2) roads could be readily turned over by MPOA without much impact to Massanutten Village privacy given that they are, pretty much, already open to the public at this time. No transfer of any other MPOA assets is anticipated because it is envisioned that the town would contract for maintenance of these roads. The total town expenditures for a town alternative including required town services (RTS) and limited road maintenance (LRM) services were determined to be $980,250 per year. The expenditures for town administration were determined to be $433,500, LRM services were determined to be $405,000, and trash collection services were determined to be $141,750. This alternative is an incorporated town of Massanutten that provides its citizens with the services of comprehensive planning and zoning, as required by the VA Code of Law. Additionally, the town would provide its citizens with maintenance services for all qualifying town roads, including those in Massanutten Village that are owned by MPOA. The MPOA roads could be turned over to an incorporated town of Massanutten along with the transfer of the majority of MPOA maintenance assets. Furthermore, the town would provide its citizens with maintenance services for all town parks, including those in Massanutten Village that are owned by MPOA. The MPOA parks could also be readily turned over to an incorporated town of Massanutten — which is logical if MPOA transfers the majority of its maintenance assets. The total town expenditures for a town alternative including required town services (RTS) and maintenance services of all qualifying town roads (RM) were determined to be $1,510,500 per year. The expenditures for town administration were determined to be $515,000, RM services were determined to be $853,750, and trash collection services were determined to be $141,750. This alternative is an incorporated town of Massanutten that provides its citizens with the services of comprehensive planning and zoning, as required by the VA Code of Law. Additionally, the town would provide its citizens with maintenance services for all qualifying town roads, including those in Massanutten Village that are owned by MPOA. The MPOA roads could be turned over to an incorporated town of Massanutten along with the transfer of the majority of MPOA maintenance assets. And, the town would provide its citizens with maintenance services for all town parks, including those in Massanutten Village that are owned by MPOA. 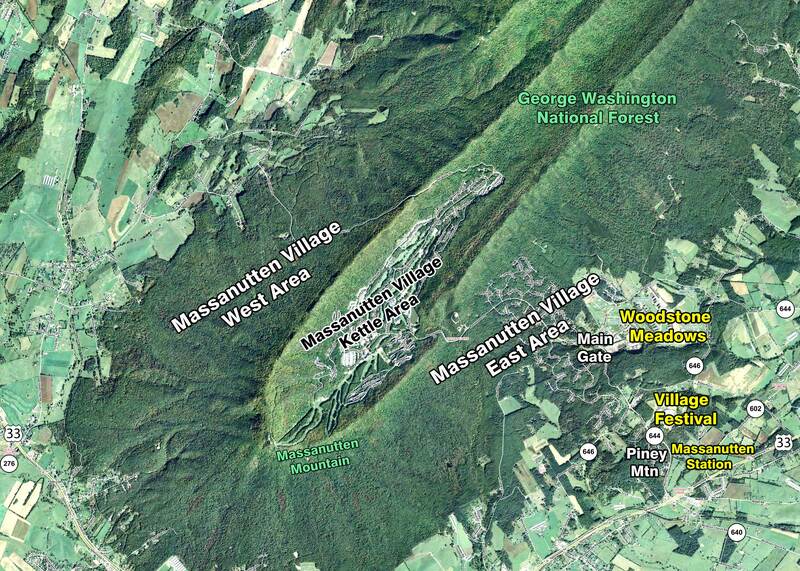 The MPOA parks could also be readily turned over to an incorporated town of Massanutten. Furthermore, the town would provide all town citizens with law enforcement services. The MPOA law enforcement assets could be transferred to an incorporated town of Massanutten. The total town expenditures for a town alternative including required town services (RTS), maintenance services of all qualifying town roads (RM), and law enforcement (LE) services were determined to be $2,348,750 per year. The expenditures for town administration were determined to be $603,750, RM services were determined to be $873,750, LE services were determined to be $729,500, and trash collection services were determined to be $141,750. This alternative is an incorporated town of Massanutten that provides its citizens with the services of comprehensive planning and zoning, as required by the VA Code of Law. Additionally, the town would provide its citizens with maintenance services for all qualifying town roads, including those in Massanutten Village that are owned by MPOA. The MPOA roads could be turned over to an incorporated town of Massanutten along with the transfer of the majority of MPOA maintenance assets. And, the town would provide its citizens with maintenance and operations services for all town parks and town recreational facilities, including those in Massanutten Village that are owned by MPOA. The parks and recreational facilities could be turned over to an incorporated town of Massanutten by MPOA. Furthermore, the town would provide all town citizens with law enforcement services. The MPOA law enforcement assets could be transferred to an incorporated town of Massanutten. The total town expenditures for a town alternative including required town services (RTS), maintenance services of all qualifying town roads (RM), law enforcement (LE) services, and recreation (REC) services were determined to be $2,479,000 per year. The expenditures for town administration were determined to be $666,750, RM services were determined to be $941,000, LE services were determined to be $729,500, and trash collection services were determined to be $141,750. REC services were placed in a separate cost center, not shown in the table, because these services are self sustaining and generate of net revenues. It should be noted that the last alternative (T5) has the least likelihood of ever becoming a reality. It was determined that the MPOA recreational facilities generate valuable net revenues that help defray MPOA administrative costs plus help offset the costs of operating MPOA amenities for exclusive free use by its members. These benefits likely outweigh any benefit of transfer to an incorporated town of Massanutten. The costs for the trash collection and recycling service was determined by taking the total number of dwellings within the town boundaries (1,125) and multiplying that by the current service rate charged by MPOA ($126). The town department expenditures for each alternative shown in the table above were derived from a more detailed analysis. The detailed analysis results are shown in the table below. The detailed analysis of town expenditures began with the staffing profiles for each alternative presented in Section VII of this report. Then, the Virginia Association of Counties (VACo) list of current employment opportunities along with a brief survey of local towns was utilized to determine appropriate salaries for the various positions in the staffing profile table. The salaries for more senior town personnel were placed on the higher end of the scale, due to the fact that Massanutten would be newly incorporated and more experienced personnel would be desired. Next, an administrative multiplier was determined for each department, which is shown in yellow highlights next to each department heading. These multipliers, which are applied to staffing only, factor in estimated annual overhead (to include employee benefits) and general administrative costs for each department. The multipliers used in this report were found to be commensurate with those currently used by MPOA and also by towns in Rockingham County. Finally, major annual recurring costs, such as road resurfacing, were added to the total cost of loaded staffing (staffing salaries times the multiplier) resulting in subtotal expenditures for each department, which were then summed for total town expenditures. It should be noted that the town will require office space to conduct town business. This space could either be rented or the town could build its own town hall. Thus, annual recurring costs for office space rental or for a mortgage associated with a town hall are included in the table under town administrative expenditures. It should also be noted that the town would have annual recurring costs for resurfacing of its roads. These costs are included in the table under town public works expenditures. They were detailed in Section IV of this report to include resurfacing all town roads over a twenty (20) year period. The town could implement such a road resurfacing program using municipal bonds, since MPOA roads are currently at the end of the 20 year period and all subdivision roads were last resurfaced over a four (4) year period of time. Finally, it should be noted that the town would likely issue a contract for the limited road maintenance delineated in alternative T2. Since MPOA would retain its maintenance assets in this alternative, it was determined that the town would not likely acquire its own assets and prefer to contract services — this contract could be issued to MPOA.